Some writers have had the urge to string words into stories from their earliest memories, while some of us don’t discover this passion until middle age or later. Whether they first scribbled a story on the back of grade school homework or had to gather courage and read their first attempt to a room of people more experienced than they were, all the good writers I’ve ever met or heard of reads, and has read, enthusiastically from childhood on. Well before I started writing seriously, I gave thanks that I was born into a family of book lovers. My parents possessed wildly different tastes in reading material, and both of them affected me. I got my love of historical romance from my mother. Her paperback books contrasted with my father’s volumes on geology, dog training, history and anthropology. 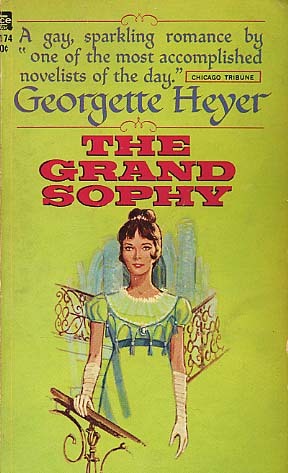 Mom introduced me to Georgette Heyer, and the late historian Barbara Tuchman. Dad’s books were drier, but watching him devour volumes on a wide range of subjects encouraged me to explore the non-fiction shelves of the library. They read to me and my sisters, everything from poems to comic books. I don’t really remember anything but pretty pictures, but the sense of security and comfort of being tucked beside them carried over into the act of reading itself. Once we could read for ourselves, we got books on most major occasions and often on smaller ones. Laura Ingalls Wilder and Louisa May Alcott were found in my bookshelves, along with Swiss Family Robinson, fairy tales and myths. I saved my allowance to buy Nancy Drew books. My dad attempted to get me interested in ‘Treasure Island‘, his favorite book as a boy, in vain. Ditto for Charles Dickens. (Sorry, Dad. I tried.) He succeeded wildly with ‘Lord of the Rings’, though. High school lit classes introduced me to John Steinbeck’s The Grapes of Wrath and The Moon is Down, as well as the sly, wry humor of Mark Twain. I found Isaac Asimov and Robert Heinlein around then as well, thanks to my best friend who shared out her brother’s science fiction books. My interest in Tolkien led me to explore other fantasy writers. The voice of Ursula LeGuin is more ambiguous and darker, but her haunting stories stay with you long after you finish them. As an adult, I discovered Jane Austen (finally!) and Thomas Hardy’s Far from the Madding Crowd, the histories and biographies written by Lady Antonia Fraser, and Elizabeth Peters’ Amelia Peabody mysteries, among many, many others. These days, I read Tolkien for comfort and inspiration, Heyer when I want to be charmed and amused, Fraser and Tuchman when I need more solid fare, C. J. Cherryh when I want to read science fiction, and Shakespeare and Homer when I’m in the mood for something classic. And I’ve read historical romance in one form or another for decades. There are so many wonderful authors out there to choose from. Who are your go-to writers for comfort or inspiration? I’m glad to see someone else discovered Jane Austen late. I didn’t read her until college and was very much “Where have you been all my life?! ?” She’s definitely my go-to author for comfort and inspiration. Lately, I’ve been on a big nonfiction binge (and not even for research). I actually had to make myself read a novel a couple weeks ago and I have an audiobook of Agincourt by Bernard Cornwell languishing in my mp3 player. I vowed I’d spend some time on fiction this month, but what did I pick up yesterday? My Life in France by Julia Child. Oh, well, I guess that’s what my brain & my heart want right now.